Speak to the gate attendants to receive 30 Safari Balls. To catch any wild Pokémon you find, toss Safari Balls at them. Often you'll have to throw food or rocks to distract certain Pokémon, so try many different combinations when a particular Pokémon keeps escaping. When you run out of Safari Balls, or walk 600 paces, you'll warp back to the gate automatically. The nice thing about the Safari is that you don't have to fight with Pokémon before you can catch them. Unfortunately, you can only catch them with the weak Safari Balls they provide you. To make matters worse, the rarer the Pokémon, the harder they are to catch! You may see a Chansey only one time in twenty, but when you do you'll probably need to nail her with two rocks before you can snare her in a Safari Ball. And since she runs at a hair trigger, it may take ten or twenty tries until you can catch her, so be patient - really patient. Here's the icing on the cake: you only get 600 paces (steps) and 30 Safari Balls. Tip: You can turn in a circle with light taps of the buttons. You will encounter pokemon but this will not take steps away! If you have an Oddish or Bulbasaur, make use of its Sweet Scent move to attract wild Pokémon without having to move (you can always catch a new Oddish if your Gloom has already replaced this basic skill). 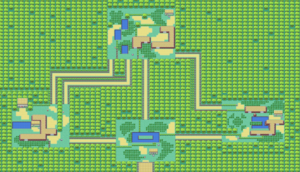 You'll be able to get around a lot better if you can cross the many ponds here, so your top priority should be to get to the Treasure House (containing HM03 Surf) in the northwest corner of Area 3. This is more complicated than it sounds, especially in under 600 steps. Head east to Area 1 from the Main Entrance, cross the two cliffs, and out to the Northwest to Area 2, then head all the way around to the exit in Area 2's Southwest corner. The house is just ahead, but don't forget to grab the Gold Teeth while you're in the neighborhood (see below). Surf can be taught to just about any Water Pokémon, and is a surprisingly strong Water attack when used in battle. 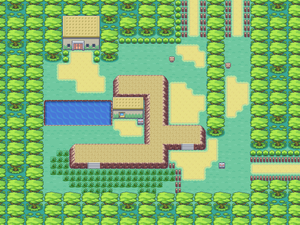 Also, a quick way to area 3 is to just surf in the pond in the middle of the main area, area 3 is if you take a left, upper left corner, there is an entrance to area 3. 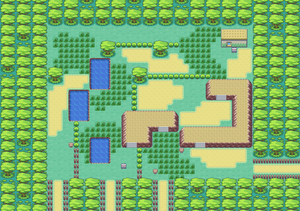 Once you get into the tall grass, where the exotic Pokémon are and you will still have about 500 steps left to find a Tauros or a Kangaskhan, both are evident in area 3, and you will need a lot of steps to get one. It's HM 04, which the Warden will hand you when you return the Golden Teeth you found in Area 3. Use this on one of your larger Pokémon, and they'll learn Strength, a technique that lets you bat aside boulders like the one on the right side of the Warden's office. Use Strength on office boulder to get at the Rare Candy that's just beyond your reach, and make sure you have easy access to the Pokémon you taught it to, since it will be a necessary item in later dungeons. In battle, Strength doubles as a basic attack, comparable in power and accuracy to Tri Attack and Drill Peck. Like all HM's, it can't be unlearned until a while later, so give it to a Pokémon who needs a source of damage and doesn't get a lot of good skills, like your brand new Tauros. Fishing is a great way to pick up some rare Pokémon, especially since it doesn't count against your "time." You need the Super Rod to catch high level Pokémon and it can catch a Dragonair, the best of the fishing lot. It may be dangling at the end of your rod, but you'll still need to use some Pokeballs to seal the deal. The Main Area contains an island, and if you can reach it, you can claim a valuable Nugget. 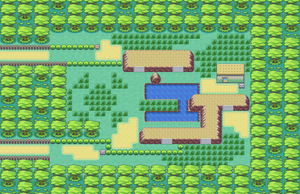 In Area One, the Poké Ball on the ledge contains a Carbos or Leaf Stone. To the left of the house nearby, you will find a Full Heal. On the patch of ground that extends into the lake, TM 11 Sunny Day can be found in the grass. And close to the entrance to Area Two, there's a Max Potion on the ground. There are just two treasures to find in Area Two, a TM 47 Steel Wing between two trees, and Protein to the left of the house. Searching Area Three is vital in order to find the Gold Teeth which lies just to the South of the left entrance to Area Two. To the left of the teeth, you will find TM 32 Double Team , while south of the Teeth, you can collect a Max Revive. Make it all the way to the bottom left corner of Area Three to find a free Max Potion. An awkward hybrid of Grass and Psychic-types, Exeggcute has good stats all around, but quite a mediocre moveset. Exeggcute only has one Psychic attack, Confusion, and aside from Solar Beam, all its other Grass moves are support based. In short, Exeggcute is not going to play a big part in your team unless you are willing to shell out the necessary TM's, such as Psychic and Giga Drain. Luckily, if you do, Exeggcute will gain the Spc. Atk to back them up once you evolve it into an Exeggutor with a Leaf Stone. But you may find it worth your trouble of grabbing one. Here are some of Chansey's highlights. She may look absolutely ridiculous, but her hit points are literally off the scale, and best of all, she's one of the only Pokémon in the game who can learn Softboiled, along with Clefable. 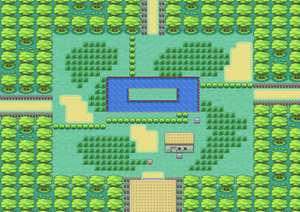 This obscure skill that can heal Pokemon even out of battle can be obtained from a Move Tutor standing across a pool in the center of Celadon City. Chansey also makes for an easy to use, incredibly effective Special wall, while not too lacking at offense when evolved into Blissey. Finally, there is a 5% chance that a caught Chansey will be holding a Lucky Egg, a held item that increases XP by a whopping 50%!!! There are many Pokémon that never learn a single skill in their own type. With no attacks to get meaty bonuses on, types can be more of a weakness then an asset, unless you spend a couple of TMs on them. And this is the problem with Rhyhorn. It's got lots of HP, a good Attack score, and a handful of good Normal attacks, but its types, Rock and Ground, make it weak against Ice, and Fighting, and extremely weak against Water and Grass. Rhyhorn evolves into Rhydon at level 42. Kangaskhan is an extremely unique Pokemon. She learns a variety of moves of all different types, her defense and attack is outstanding (not as good as Tauros, but still great). However, Kangaskhan is outclassed by Tauros with his offensive capabilities. Despite this, Kangaskhan's a great Pokemon, and its moves, Fake Out and Dizzy Punch make fighting a Kangaskhan a quite annoying prospect. Also, you've gotta love the little guy in the pouch. There are a lot of players who believe that Tauros is the strongest of the Normal-type Pokémon. He certainly has some of the best stats: Fast, tough, and with a good chunk of HP, Tauros' only problem is merely average offensive strength and lack of interesting attacks. Its Stomp is pretty good, since it can cause a Flinch effect, but there's nothing worth much between that attack (at level 21) and Take Down (which works well with his high HP) at level 51. He can learn Strength though, and that's a pretty good match. Venonat, a Bug/Poison Pokemon, is yet another of those Pokemon that are mostly forgotten by most. Unlike most Bugs, however, Venonat displays a strong array of moves, including Psybeam and Psychic. Unfortunately, while Venonat has decent Speed and Spc. Def stats, it will never acquire the strength to make those moves worthwhile. Venonat evolves into Venomoth at Level 31. Players can fish up one of these Water-type Pokémon if they really want to. Psyduck starts with nothing in the way of viable attacks and won't get the good stuff like Fury Swipes and Hydro Pump until much later. They can do some damage with Surf, but their stats are just too low, even after evolving into Golduck. Slowpoke, on the other hand, grow to be strong. Water and Psychic makes for a weird combo, but Slowpoke (and its evolved form Slowbro) learns some strong techniques in both, and have good enough stats to make good use of them. Also, they can learn Surf, so fish one up. This page was last edited on 28 March 2019, at 17:02. This page has been accessed 2,223,359 times.